264 journalists and media associations have registered complaints at Metro Center, whom 349 violations have been committed against. In Kurdistan Region, the freedom of press and the right of knowing (access to information) have been protected by the Press Code number (35) in 2007 and the Code of the Right to Information number (11) in 2013, however; continuously in the political tensions the journalists face threats, harassments, beating, apprehension, and various violations, and the doers have escaped penalty. The Press Code number (35) in 2007 was supposed to become a conduct principle for the security forces, the ones who are in charge in the parties and for the courts in how they are supposed to treat the journalists, as indicated in the second section of the fourth part, which mentions "The opinion concluded by the journalist, or the information he/she publishes are neither to cause destruction in his/her life situation, nor to harm him/her or his/her rights." In spite of the other articles of the code, the law has been disabled, here. The information journalists publish will become a threat on his/her life, and this is what the last years' events have told us. So far, there is no political intention that may be ready to make Kurdistan a democratic torch for the region, in which the journalists would do their job without fearing any revenge threat. Metro Center asks the Kurdistan Regional Government to thoroughly re-investigate those attacks on the journalists that have stayed unresolved, and to provide guaranties to protect safety of the journalists' life while they prepare their reports about corruption and mishandling authorities. Awena Newspaper, one of the private newspapers in Kurdistan issued in 2006 by Awena Company, has stopped for an unspecified time because of financial crisis. The stoppage of Awena Newspaper happens in a time when the shadow media of the parties are supported in a daily basis by political and governmental figures affiliated with the parties, and a day would not pass without the emergence of one of those electronic websites. Awena Newspaper was belonging to Awena Company, which has been working independently without being a show of any party, whose first issue has been published in 3rd January 2006, however; it has been closed after 12 years. During the last four years, the economic situation of Kurdistan Region has directly affected the media centers and journalists. Throughout 2018, an apparent number of TVs, radios, magazines, newspapers and websites has been closed. Moreover, most of the other ones started austerity policy, reducing the number of the journalists and dismissing a proportion of them, sending them back home, which led to the joblessness of hundreds of journalists. In this situation, even some Medias have not taken articles and subjects of the Press Code in the consideration, and they sent the employees back home without providing their rights. Meanwhile, the 6th and 7th points in the 7th article of the Code say that, "If an essential change happened in the policy of the newspaper that the journalist works in, or if his/her contract situation (circumstance) has changed, the journalist is illegible to terminate the contact from his/her side, in condition to notify the newspaper before (30) days of this termination, and the journalist's right of compensation is not to be lost." And say, "The media associations and newspapers' directorates must commit to the rights that are specified for the journalists in applicable laws and contracts accepted by the journalists' Syndicate." In front of the decline of free media, every day tens of fake "Ulooj" digital Medias throw a link or new news into social media, like a proven reality, without considering the least professional ethics, each time targeting a person or a party. Fake news and forging lies in digital media come in different forms, but the most obvious ones are two types that have one goal, both are used to mislead people under the name of free press. The first one is a deal made between the owner and a person from or a cadre of a party. The second type is anonymous and appears to be unowned by anyone, but their true owners are still party officials and their sons, or someone close to both of them is the owner. Their goal is to defeat their opponents, inside their parties and outside them as well. Some cheaters and news pirates direct them, whose job is to infuse lies and ruin the personalities of their opponents. Those would not work according to the logic and ethics of journalists, but according to the logic of advantage. They would not represent people in the monitoring function, but they represent parties, and inside the parties they shadow a political, military or security person. In the news jungle of this ugly political age, fake news and documents are produced and publicized warmly by political financing; many digital Medias which lack professional ethics would deform the truth. The audiences will be impacted in a way that they would not distinguish between true and fake news. "Responsibility" is missing amongst the body of this ragged fake Medias. We need a kind of defense against fake pages' virus and fake electronic media, which are managed by political financing. A kind of defense that would not narrow down the freedom and freedom would not become a lifeboat for the ones who would attack, slander, and establish lie manufacturing, producing cheating and news pirating "journalists". Amongst this scene, an electronic army mostly managed by political financing, abusing technological development, and working through unowned pages behind their computers; is trying to deform free journalists and free press. "Reporters without Borders" organization has shed light in its newest report on the threat of the electronic armies on the free press. In this concern, Christopher Dullwar says, "Electronic assault is a global phenomenon, today it has become the most dangerous threat on free press, the electronic war is not only started by countries, but the enemies of free press have established an electronic army to attack and weaken the ones who seek to find truth." Dullwar emphasizes that "the tyrants (oppressors) target the journalists, through their mercenary agents in the social media, like the person who shoots bullets on his/her opponent in the battle field and kills him/her." Last year, tens of independent pages in Facebook social media, who were posting scientific, medical, artistic, athletic, and humorous topics under different names; now political parties' activities, news, and advertisements are posted in them. Their pages would empty and deform journalistic topics from their content and meaning, riding organized attacks on journalists and targeting women journalists as well. Metro Center will provide a report about this case in the middle of this year. Metro Center has announced in several occasions that it does not act against anyone or any party that appeal to the courts instead of using violence to resolve their cases with journalists and channels. However, "the rise of lawsuits and focusing on a certain channel in a specific time, and the increase of the lawsuits, would produce the suspicion that they may intend to make pressure, rather than the rule of law". In November, especially after NRT channel has allocated a great deal of its coverage for the problems of dormitory students at University of Sulaimany; the channel has been called six times for inquiry about its previous cases. Even before, KNN channel has been confronted with several lawsuits; such as a lawsuit by a PUK Leadership member and one of the previous commanders of Kirkuk Military axis, who have registered a legal complaint against the channel director, Ranya correspondent Ranj Osman, and the News Room employee Pshdar Babekir. The complainer was asking for compensation about one billion Iraqi Dinars, according to articles of the Iraqi Penal Code. Moreover, another lawsuit has been filed by the first deputy of PUK general secretary. Other lawsuits were against Tariq Fatih the chief editor of Hawlaty Newspaper, Ashty Abdulla who is in charge of the woman page in Kurdistani Nwe Newspaper, Shwan Muhammed the chief editor of Speemedia, and Barham Salih the journalist at NRT, while all those who registered lawsuits could have tried to respond by writing and publishing explanations about those topics. We think that the ground should be prepared to let the Medias present the mistakes, defects and corruption to the public and the government, like an active monitor, meanwhile; the law should not be used like a silencing factor or pressure on journalists and associations. The code number (11) in 2013, the code of the right to obtain information in Kurdistan Region, includes a good explanation of the international measures of rights and freedom. According to the code articles; journalists, researchers and people are free to obtain information, and if impediments have come across them, then the courts will get their rights back to them. According to the 3rd article of the code, the Independent Committee of Human Rights in Kurdistan Region (which has been established according to the code number 4 in 2010) has been made responsible for following up with the implementation of this code. In the meeting of 11th of October 2016 by Kurdistan Regional Government's Council of Ministers, the decision was made to approve the instruction number 11 of the code of Right to Information, and we have welcomed this decision. However, the impediments have not been removed in front of the implementation of this code, until now most of the information is in dark rooms, and most of it is still classified in secret. "Metro", to motivate the institutions of Kurdistan Regional Government, has conducted a survey among journalists in Duhok Governorate, and has published the results of the survey in a press conference inside the Municipality Council, there. On 2nd of January 2018, under the pretext of covering the demonstrations in Koya district and incitement of violence; the arrest order has been issued by east Hawler-Koya police office to arrest Khalid Muhammed the correspondent of NRT channel. On 3rd of January 2018, while preparing a report in Sargaran sub-district of Dbz district, a KNN channel team (Jwanro Muhammed and Hardy Bahadin) have been arrested by an armed force for a while and their press equipment has been confiscated. On 11th of January 2018, at the general hospital of Shahid Peshraw in Chamchamal, an officer attacked a KNN channel team (Ary Luqman and Hemn Ahmad) and they have been prevented from coverage. On 13th of January 2018, in Kirkuk Governorate, a sound hand grenade has been thrown into the house of Reuters Agency's photographer (Ako Rashid). On 16th of January 2018, by several unknown people, the journalist (Sarbast Tariq) has been threatened who works at 4K News Website in Erbil Governorate. On 17th of January 2018, while covering the event of fire at Sulaimany main grocery, the security forces attacked Kurdistan TV channel and they have been deprived from coverage. On 28th of January 2018, in Kfry district, Dyar Jamal the correspondent of Kurdistan 24 told Metro that "because of preparing several reports, late at night, my car was broken by several people". On 29th of January 2018, a security force broke into the house of the war journalist and photographer Hushyar Ramazan in Kurdistan quarter in Kirkuk Governorate, then the force abduct him and after 30 minutes they threw him near Kirkuk Airport. On 29th of January 2018, through phone call made by unknown people, the journalist Dyar Jamal has been threatened who is the correspondent of Kurdistan 24 channel in Kfry district. On 2nd of February 2018, at Degala checkpoint, Chatr Company journalistic team members (Chenar Hassan, Brwa Mahmood, and Avin Hersh) were visiting the coverage of a march conducted by "Country Protecting Youth", heading to go to Afreen; the team has been shot by security forces, humiliated and their press equipment have been confiscated. On 21st of February 2018, while Lamia Rasool the correspondent of War TV was visiting University of Sulaimany to prepare a report, she has been impeded by the University guards. On 22nd of February 2018, at Degala checkpoint, Chatr Company journalistic team members (Chenar Hassan, Brwa Mahmood, and Avin Hersh) have been impeded to go to Afreen city in West Kurdistan to cover the Turkish army's attack. On 25th of February 2018, the NRT channel team members (Omed Chomany, Muhammed Idrees) have been impeded by the security forces in Erbil to cover a conference at Saa'd Abdulla Conference Hall. On 27th of February 2018, during a press conference by the director of the international Erbil Airport, the NRT channel team members (Hersh Qadir and Karzan Karim) have been impeded by the airport security forces to cover the press conference. On 1st of March 2018, while covering an explosion event in Bina Slawa sub-district in Erbil Governorate, the NRT channel team members (Renas Ali and Hassan Mawlood) have been impeded and deprived from covering the event. On 7th of March 2018, through the social media, Dyar Jamal the correspondent of Kurdistan 24 has been threated to death. On 14th of March 2018, in Erbil Governorate, members of an NRT press team (Hersh Qadir and Muhammed Edrees) have been impeded by PUK political bureau guards, and they have not been allowed to cover the gathering of PUK supporters. On 20th of March 2018, at Qasre security checkpoint, Rozh News correspondent (Zosk Hamad Mina) has been impeded and prevented from covering Nawroz Celebration in Qandil foothills. On 24th of March 2018, at Zargata hill in Sulaimany, some guards of an official of Goran beat the journalist (Sabah Ali Qaraman) and wounded him. On 25th of March 2018, the local channel Khakbeer close to Kurdistan Islamic Union in Zakho district has been closed by a security force. On 25th of March 2018, Wrya Hama Karim the correspondent and the person in charge of NRT office in Halabja Governorate has been arrested upon a lawsuit filed by the Governor of Halabja. On 25th of March 2018, the freelance (independent) journalist Bashdar Othman has been arrested by the security forces in Erbil city. On 25th of March 2018, in Sulaimany city, while covering a demonstration by instructors of University of Sulaimany's, some protesters have humiliated correspondents of Speda channel (Yadgar Hjy and Khabat Hamid) and didn't let them cover the event. On 25th of March 2018, in Erbil city, with rubber bullets and pistol, security forces have attacked NRT correspondents (Renas Ali and Hersh Qadir) and the photographers Muhammed Edrees and Amanj Samy, from which three of them have been injured. On 25th of March 2018, while covering demonstrations by Sulaimany clinical employees in front of the emergency hospital, Kurdistan 24 channel team members (the correspondent Dalya Kamal and the photographer Barham Jamal) have been impeded. On 25th of March 2018, in front of Sulaimany Court, Speda channel's correspondent (Bestun Muhammed) has been humiliated by some protesters. On 25th of March 2018, a security force of Erbil governorate, in front of Shanadar General Park, has impeded an NRT press team (Omed Chomany and Karzan Karim), and the team has been prevented from covering a demonstration. On 26th of March 2018, in front of Erbil Educational hospital, protesters impeded the correspondent of Rudaw channel (Syamand Karim). On 26th of March 2018, in front of Soran district's directorate of education, Payam satellite channel correspondent (Ibrahim Ismaeel) was impeded by security forces to cover the demonstration. On 26th of March 2018, in Duhok governorate, both KNN correspondent (Mazin Shangal) and photographer (Masood Hady) have been impeded by a security force and their press equipment has been confiscated. On 26th of March 2018, in Erbil governorate, both KNN correspondents (Hazhar Anwar and Salih Harky) have been impeded by a security force. On 26th of March 2018, in Erbil governorate, Rozh News Agency correspondent (Bryar Muhammed) has been impeded by security forces. On 26th of March 2018, in Zakho district, the freelance (independent) journalist (Hassan Hussein) has been attacked by a security force and they beat him. On 26th of March 2018, in front of Sulaimanya Court, Rudaw channel correspondent (Jamal Ahmad Jamil) and the phographer (Alan Muhammed) have been impeded by protesters, and in the same day for the second time the protesters attack both of them in live-coverage. On 26th of March 2018, (Yasir Abdulrahman) the correspondent of Speda channel in Duhok has been detained for several hours by the security forces. On 26th of March 2018, Payam channel correspondent (Araz Aziz) and photographer (Mutallib Khoshawee) have been detained for several hours in Erbil city by the security forces. On 26th of March 2018, (Sirwan Zebary) the journalist in Speda channel in Akre district has been detained by the security forces. On 26th of March 2018, while covering a press conference of the protesting teachers at Kanyaw Park in Erbil city, NRT team members (Harsh Qadir and Karzan Karim) have been impeded by a force that humiliated them as well. On 26th of March 2018, security forces of Erbil city have impeded Payam channel team members (Walid Saleem and Abdulla Yunus) from covering the demonstrations. On 27th of March 2018, in front of Shanadar Park in Erbil city, a security force attacked two NRT press teams (Hersh qadir, Amanj Sami, Renas Ali, and Karzan Karim). They have been impeded from coverage, and their personal and press equipment have been confiscated and under detention until the time of preparing this report. On 27th of March 2018, security forces of Erbil city have impeded Payam channel team members (Walid Saleem and Abdulla Yunus) from covering the demonstrations. On 27th of March 2018, security forces of Erbil city have impeded the journalist (Alan Sahebqran) from covering the demonstrations. On 27th of March 2018, (Akar Faris) Speda channel correspondent in Erbil city has been arrested by security forces. On 27th of March 2018, in Erbil city, a person dressed like civilians attacked the female journalist (Niaz Abdulla) assaulting her, but the protesters protect her from being hurt. On 27th of March 2018, the security forces in Erbil city impeded (Hana Chomani) the correspondent of Dwarozh website from coverage and they attack her. On 28th of March for the second time by the security forces she has been attacked, tortured and detained for two hours. On 27th of March 2018, in Akre district, several people dressed like militants have attacked Kurdsat News correspondent (Dlbrin Sherwani), he has been tortured and later the security forces have arrested him. On 28th of March 2018, (Ammar Rajab) an NRT channel photographer in Duhok city has been arrested by the security forces. On 2nd of April 2018, NRT channel team has been impeded by Sulaiman security forces from covering the demonstration of clinical employees. On 2nd of April 2018, Security forces in Sulaimany city have impeded (Ehsan Sabir) Payam channel correspondent from covering the demonstration of clinical employees. On 3rd of April 2018, during the coverage of Erbil governorate's demonstrations, the security forces have impeded the NRT channel correspondent (Hersh Qadir) and his press equipment has been confiscated. On 3rd of April 2018, during the coverage of Sulaimany governorate's demonstrations, the security forces have impeded the NRT channel correspondent (Karzan Tariq) and he was not allowed to cover the demonstration. On 3rd of April 2018, during the coverage of Sulaimany governorate's demonstrations, the security forces have impeded the Payam channel correspondent (Ehsan Sabir) and he was not allowed to cover the demonstration. On 3rd of April 2018, ordered by the deputy governor of Kirkuk, the journalist (Hunar Ahmed) from Rwdau channel has been arrested by the security forces. On 5th of April 2018, while covering the protesting teachers' demonstration in front of Sulaimany Court, Arasta website correspondent (Jaa'far Hussein) has been impeded. On 8th of April 2018, in front of western Sulaimany directorate of education, SharPress team members (Hersh Rashid and Soran Ahmad) have been impeded by security forces. On 8th of April 2018, in front of Ranya directorate of education of Raparin Administration, the security forces have impeded a KNN team and they have been prevented from covering the protesting teachers' demonstration. On 11th of April 2018, the security forces in Duhok governorate impeded a Rozh News agency team and they have been prevented from covering the condolence ceremony of (Damhat Ahmad). On 25th of April 2018, the journalist and NRT channel presenter (Khawan Farwq Muhammed) known as (Khawan Qaradaghy) told Metro that "because of my job, through social media and text messages, it has been several days that I have been threatened to death and to be beheaded". On 4th of May 2018, by the security forces in Duhok governorate, Kurd News channel's correspondent (Nuraddin Harky) has been attacked, humiliated, and impeded from covering election campaign of Naway Nwe list. On 10th of May 2018, by the security forces of Said Sadiq district, Rozh News Aency correspondent (Ali Hama Saeed) has been impeded and they didn't let him cover the special voting process for the Iraqi Parliament Assembly. On 10th of May 2018, while covering the special voting process at Rwnaki voting station in Bakrajo quarter in Sulaimany, Kurdistan TV team members (Shilan Faraj and Twana Harwni) were attacked by security forces; their press equipment has been confiscated and not allowed to cover it. On 10th of May 2018, at Kozhin voting station in Hajy Awa sub-district, security forces impeded Khandan channel team members (Hemn Hassan, Awat Othman and Dana Sofy) and they have not been allowed to cover the special voting process. On 10th of May 2018, in Raparin Administration, both correspondents of Rozh News agency (Muhammed Hassan and Tahir Ebraheem) have been impeded and prevented from covering the special voting process for the Iraqi Parliament Assembly. On 10th of May 2018, the security forces in Raparin Administration, both correspondents of Rozh News agency (Rawand Muhammed and Nizam Shabib) have been impeded and prevented from covering the special voting process for the Iraqi Parliament Assembly. On 12th of May 2018, the security forces of Sharazoor district in Sulaimany governorate impeded a KNN channel team and prevented them from covering general voting process. On 12th of May 2018, at Chia voting station in Sulaimany governorate a security force has impeded (KNN, Rozh News, NRT, Khandan, Kurd News, Payam, and Speda) channels and prevented them from covering general voting process. On 12th of May 2018, during the general voting process for the Iraqi Parliament Assembly, security forces impeded Rozh News correspondent (Dana Omer) and prevented him from covering the process. On 26th of May 2018, at Nawroz quarter in Dohok governorate, a force dressed like civilians have abducted the journalist and activist (Mustafa Salih Bamarny) and later arrested him for 14 hours. On 2nd of June 2018, by the security forces in Bradost sub-district, each one of the channels of (NRT, Payam, Speda, KNN, and Khandan) has been impeded, and they didn’t let them cover the arrival of Turkish army to Barmiza village in Bradost sub-district. On 3rd of June 2018, (Shna Fayaq) the chief editor of Rozh News agency has announced "the formal website of Rozh News agency has been hacked into by unknown people". On 7th of June 2018, due to critiques against Sulaimany Sports Club, the club president has registered a lawsuit against the sports journalist (Daner Arsalan) . On 9th of June 2018, by the technical department of Ministry of Culture, Sroosht local channel has been stopped, under the pretest of degrading women. On 26th of June 2018, in Shekhan district of Duhok governorate, security forces attacked NRT correspondent (Taif Goran) while covering protest of vehicle drivers' demonstration, his press equipment has been confiscated and he was not allowed to cover the demonstration. On 3rd of July 2018, when the weaponry and explosive materials' storage of the Forces (70) took fire, Tasluja area in Sulaimany governorate, the security forces have impeded the press channels (Khandan, NRT, KNN, Payam, Kurdistan 24, Sulaimany News Network Website, Nawa Radio, Rwdau, Khalk Website, Sharpress Website, Al-Sharqiya, Al-Iraqiya, Speda, Westga News Website and Anadol Agency), and part of their press equipment has been confiscated and they have been treated in an inappropriate way. 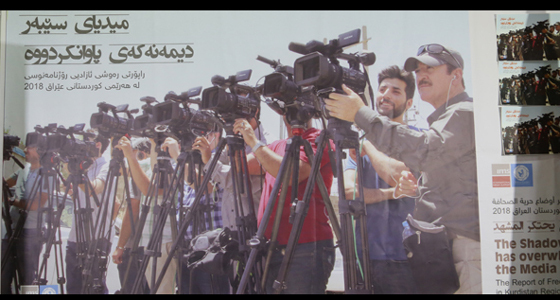 On 3rd of July 2018, a number of Erbil journalists (Hersh Qadir, Bryar Muhammed, Sartip Qashqayee, Kocher Ali, Rebwar Kakayee, Renas Ali, Akar Khalid, Hazhar Anwar, Omed Chomany, Akar Faris, Salih Harky, Karwan Shwany, Waly Salim, Muhammed Shekh Bzeny, Ahmed Mustafa, Hana Chomany, Aso Hirany, Hogr Omer, Aras Aziz, Esa Abdulqahhar, Shawkat Qadir, Karwan Othman and saeed Abdulla) announced that "the Ministry of Finance in Kurdistan Regional Government does not give them information and they discriminate among the journalists". On 9th of July 2018, at the manual counting center for the election votes in Sulaimany governorate, press channels have been impeded from covering the process, and only Al-Iraqiya channel has been permitted to cover the process. On 21st of July 2018, security forces in Sulaimanya governorate have impeded holding the 10th anniversary of the journalistic martyr (Soran Mama Hama). On 21st of July 2018, while impeding to hold the 10th anniversary of the journalistic martyr (Soran Mama Hama), security forces in Sulaimany governorate have attacked Payam channel cameraman (Renas Arsalan) and his press equipment has been confiscated. On 22nd of July 2018, by the security forces in Erbil governorate, the NRT channel program (Think Twice) has been impeded from production. On 22nd of July 2018, at the Erbil International Airport, the airport's security forces have impeded Payam satellite channel team members (Zryan Sdeeq and Omran Ameer) from covering pilgrimages' trip. On 23rd of July 2018, at Saa'd Abdulla in Erbil governorate the security forces impeded a team of Payam channel (Aras Aziz and Mutallib Khoshawee) and didn’t permit them cover the conference of Kurdistan Islamic Scholars' Union. On 23rd of July 2018, security forces have impeded Payam channel team members (Walid saleem and Yunus Abdulla) and didn’t permit them cover the armed attack on the Erbil Governorate's Building, and their press equipment has been confiscated. On 23rd of July 2018, security forces have impeded two press teams of NRT channel (Hersh Qadir, Omed Chomany, Renas Ali, Karzan karim, and Zana Sherzad) and didn’t permit them cover the armed attack on the Erbil Governorate's Building, and their press equipment has been confiscated. On 25th of July 2018, security forces in Erbil governorate have impeded NRT channel team members (Herish Qadir and zana Sherzad) and they have been prevented from covering the press conference of the election institution of PDK. On 26th of July 2018, the Ministry of Culture in Kurdistan Regional Government has stopped the broadcasting of the local channel (Azady). Handren Ahmed the person in charge of Media in Kurdistan Communist Party has told Metro that "The stoppage of Azady broadcasting is under the circumstance of regulating the local channels' frequencies" and said "Azady channel has been established since 1992 and since 2009 we have been asking for license from the ministry of Culture and Youth, but when our request reaches the Ministry of Interior, our request is not answered." 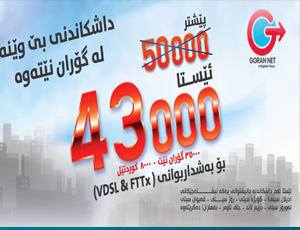 Also, the local channels of (NRT, Kurd Land, and Baran) have been stopped from broadcasting under the pretext of not been given loans, and lacking broadcasting license. On 12th of August 2018, during the opening ceremony of Qaiwan University in Sulaimany governorate, by the guards of the minister of Higher Education, the KNN channel correspondent (Bryar Namiq) has been impeded and prevented from getting a statement from the minister of higher education. On 12th of August 2018, ordered by the deputy governor of Kirkuk, the arrest warrant has been issued for 10 journalist and activists from Kirkuk. On 14th of August 2018, during a press conference by the Minister of Martyrs and Anfals of Kurdistan Regional Government in Erbil governorate, security forces have impeded members of NRT team (Hersh Qadir and Majid Abdulmanaf) and prevented them from covering the press conference. On 25th of August 2018, an RPG Rocket-Propelled Grenade has fallen into the building of Kirkuk satellite channel, causing material damages to the channel center. On 30th of August 2018, each one of (Khandan and Kurd News) channels has been closed by an order from their political parties. On 2nd of September 2018, at Salim Street in Sulaimany city, security forces impeded (Bzhar Dabbagh) the correspondent of NRT channel and he was not allowed to cover "the assault of some armed persons on some traffic policemen". On 4th of September 2018, at Zargata Hill in Sulaimany city, the guards of Prime Minister impeded (Peshkawt Abdulla (the correspondent of Radio Nawa and (Pshtiwan Jamal) and they were not allowed to cover the meeting between PDK and Goran Movement. On 4th of September 2018, several persons from which some of them were armed, in front of Majidy Mall in Erbil governorate, an NRT team (Ahmed Mustafa, Najm Sidiq, and Abdulla Burhan) have been attacked and as a result of that the correspondent Ahmed Mustafa was injured. On 28th of September 2018, during the special voting process for the election of Kurdistan Parliament Assembly, (Sirwan Ghareeb) the editor in chief of Westga News website has been attacked by some armed members of Sulaimany city security (Asaish) at sarkawtn voting station in Sarchnar, and he has registered a lawsuit against the director of Sulaimany city security (Asaish). On 28th of September 2018, during the special voting process for the election of Kurdistan Parliament Assembly, (Brwa Bradosty) the correspondent of Gali Kurdistan cahnnel in Soran district and his team has been attacked by several armed people, while they have been legally covering that, permitted by the Independent High Elections and Referendum Commission in Kurdistan Region. On 28th of September 2018, during the special voting process for the election of Kurdistan Parliament Assembly, (Sanger Abdulrahman) the corresnpondent of Rudaw media network in Koya city has been impeded by a force. On 28th of September 2018, during the special voting process for the election of Kurdistan Parliament Assembly, (Khalid Ahmed and Majid Btweny) team members of KNN have been impeded at Shahid Mhammed Haji School in Chwarqwrna, as some officers have threatened them that they may break their press equipment. On 28th of September 2018, during the special voting process for the election of Kurdistan Parliament Assembly, (Hawzhin jamal, Ebrahim Fatah, and Barham Jamal) the journalistic team members of Kurdistan 24 have been impeded from coverage in Sulaimany at Sarkawtn voting station. On 28th of September 2018, during the special voting process for the election of Kurdistan Parliament Assembly, (Yadgar Esmaeel and Aryan Bakir) Speda channel team members have been attacked and dismissed from Sarkawtn voting station in Sulaimany city. On 28th of September 2018, during the special voting process for the election of Kurdistan Parliament Assembly, (Shilan Faraj and Daban Sarwar) Kurdistan TV team members have been impeded at Zalle school-Tasluja in Sulaimany city. On 28th of September 2018, during the special voting process for the election of Kurdistan Parliament Assembly, (Khalid Muhammed) the NRT correspondent in Koya city has been impeded from coverage, as a Peshmarga officer, even from one kilometer distance away from Sarbakh School, didn’t let him cover it. On 28th of September 2018, during the special voting process for the election of Kurdistan Parliament Assembly, (Hazhar Rasheed and Dilshad Mam Taha) the KNN team members at Sarbakh School have been impeded from coverage, as a Peshmarga officer, even from one kilometer distance away, didn’t let him cover it. On 28th of September 2018, during the special voting process for the election of Kurdistan Parliament Assembly, (Madih Jamal) Speda correspondent has been impeded at Sarbakh School in koya city. On 28th of September 2018, during the special voting process for the election of Kurdistan Parliament Assembly, (Hangaw Mhammed) NRT correspondent in Ranya has been impeded from coverage and says, "No voting station has been specified for media coverage". On 28th of September 2018, during the special voting process for the election of Kurdistan Parliament Assembly, (Bryar Namiq and sarkawt Ghareeb) KNN channel team members, in Sulaimany city at Areen voting station in Kany Kurda, have been impeded while as they were saying this station was open for PUK channels. On 28th of September 2018, during the special voting process for the election of Kurdistan Parliament Assembly, (Zuber Bradosty) Rozh News correspondent in Sidakan has been impeded from coverage by security forces. On 28th of September 2018, during the special voting process for the election of Kurdistan Parliament Assembly, (Abubaker Hussein) KNN correspondent and his team, at Chia school in Said Sadiq, which was specified for media coverage, have been impeded as the voters broke the door and didn’t let any channel to cover the process. On 30th of September 2018, at the end of the general voting process for the election of Kurdistan Parliament Assembly, at Sharo voting station in Sulaimany governorate, security forces have attacked Kurdistan TV channel team members (Hevy Hiwa and Daban Sarwar) and they were beaten, humiliated and their press equipment has been confiscated. On 30th of September 2018, at the end of the general voting process for the election of Kurdistan Parliament Assembly in Erbil governorate, several unknown people attacked (Salih Harky) KNN channel correspondent and he has been detained for a while. On 30th of September 2018, through unknown phone number in Sulaimany governorate, (Rebaz Majeed) the Voice of America correspondent has been threated to death. On 9th of October 2018, while opening the project of (Changing Prison into a Library) at the women and adolescent reformatories in Sulaimany, the checkpoint of the Force (70) impeded several press teams. Awat Mahmood the correspondent of NRT channel told Metro that, "My cameraman (Zanko Taha) and I wanted to go to Sulaimany women and adolescent reformatories to cover the opening ceremony of the project of (Changing Prison into a Library), but by the checkpoint guards of the Force (70) we have been impeded and they didn’t let us go inside". Also, Lamia Rasool the correspondent of War TV channel has told Metro that, "In spite of receiving an invitation letter to attend this activity to cover it, my cameraman (Muhammed Azad) and I have been impeded by the checkpoint guards of the Force (70)". Ary Luqman the correspondent of KNN has told Metro as well that, "In front of the checkpoint of the Force (70), The cameraman Hardy Bahadin and I have been impeded, while we were witnessing that several journalists from the other channels have been permitted to enter the ceremony and cover it". Moreover, the cameramen Ebrahim Fatah, Hama Tayeeb and Hazha Ghafoor the correspondent of K24 and Barham Latif the correspondent of Rozh News agency have been impeded. On 14th of October 2018, while trying to get information and enter Hajy Omaran boarder customhouse, Rozh News correspondent (Zosik Hamad Amin) has been impeded. On 19th of October 2018, while doing their journalistic job, Kurdistan 24 channel press team members (Mahir Shangaly and Naif Abdo) in Shangal district have been arrested by Popular Mobilization Units, known as Hashd Al-Shabi. On 20th of October 2018, in Erbil Governorate, KNN correspondent (Hersh Qadir) has been impeded and prevented from getting a statement from the director of Independent High Elections and Referendum Commission in Kurdistan Region. On 26th of October 2018, at the Hajy Omeran border checkpoint, the correspondent of Kurdsat News (Twana Omer) has been arrested for three days. On 26th of October 2018, the security forces in Erbil governorate have impeded an NRT channel team from producing a report. On 30th of October 2018, the journalists (Saeed Abdulla, Bryar Muhammed, Salih Harky, Hazhar Anwar, Kochar Ali, Hersh Qadir, Rebwar Kakayee, Ahmed Mustafa, Omed Chomany, Aram Bora, and Hemin Baban) have individually informed Metro that "they are not given statements by the Independent High Elections and Referendum Commission in Kurdistan Region, and the Commission commits discrimination among the press agencies". On 1st of November 2018, security forces of Balakayaty sub-district have impeded (Zosk Hamad) the correspondent of Rozh News agency and he was not permitted to cover the flood damages in the region. On 2nd of November 2018, while trying to cover the flood damages in Balayan area in in Sharade of Qasre, the correspondent of Rozh News agency (Zosk Hamad Mina) has been impeded by Asaish. On 13th of November 2018, officials in PUK registered a lawsuit against (Ako Hama Kareem) the director of KNN channel and (Ranja Othman) the channel's correspondent in Raparin Directorate. On 14th of November 2018, in Erbil governorate during a press conference of the minister of Martyrs and Anfals of Kurdistan Regional Government, the NRT channel team members (Hersh Qadir and Hassan Mawlud) have been impeded and prevented from covering this press conference. On 20th of November 2018, upon a video that has been publicized, (Elham Khalid) the correspondent of Yalla Kurdy Website and (Razar Fahmi) the establisher of Yalla Kurdy Website have been threated on call and humiliated by phone. On 27th of November 2018, after NRT channel has allocated a great deal of its coverage for the problems of dormitory students at University of Sulaimany; the channel has been called six times for inquiry about its previous cases. On 27th of November 2018, during the closure of Tavgary Azady's Headquarter by Sulaimany Asaish, the cellphone has been taken from Rozh News agency correspondent (Barham Latif) and later he has been tortured and humiliated. On 29th of November 2018, during a meeting between Baray Turkumany Party with the Turkish Consulate, a member of Baray Turkumany Party has impeded a journalistic team of Rozh News agency from covering the meeting. On 30th of November 2018, Gojar checkpoint has impeded Rozh News agency correspondent (Zosk Hamad Mina) and he was not allowed to get into the foothills of Qandil to cover a national activity by citizens of this area. On 16th of December 2018, security forces of YPJ in Shangal district have detained Rwdau media network team members (Tahsin Qasim and Adil Kor) for four hours. On 17th of December 2018, while covering a public demonstration in Erbil governorate against the Turkish Army's attacks on Kurdistan Region's borders, security forces have impeded the correspondent of NRT channel (Rzgar Kochar) and his press equipment has been confiscated. On 19th of December 2018, in Erbil city Bazar, several persons attack (Soran Esmaeel) the presenter at Net TV and he has been injured. On 21st of December 2018, on Salim Street in Sulaimany city during a demonstration, Sulaimany Asaish arrested each one of the four journalists (Barham Latif) Rozh News agency correspondent, (Darya Daniz, Zhya Esmaeel, and Darya Abubaker) at Chatr company, who have been there to cover the demonstration. On 25th of December 2018, while covering the demonstration of Kalar general grocery salesmen, security forces have impeded (Sharmin Ali the correspondent at KNN channel, Ali Hussein the correspondent at Speda channel, and Ahmed Hamid the editor at Dang Radio) have been impeded, their press equipment has been confiscated for a while, and they have been obliged to delete all their photos and videos. The meeting emphasized freedom of expression as a universal right, the implementation of Low of Organizing Journalistic Work, #35 & Law of Access to Information, #11, and denounced incitement of violence and intolerance in the media. •Government Institutions and establishments must guaranty journalistic freedoms, as they are stated in the laws of Organizing Journalistic Work, and Access to Information. They should not engage in any limitation of the rights that are guaranteed by law. •Violations against journalists must stop. Especially, the closing of Media organization offices. No Media organization should be closed without an order from a judge. •The civic expression of opinion is a natural and legal right that should not be taken away for any reason. •The justice system must be activated to protect the rule of law, and bring violators against journalists to justice. All those who injured & illegally detained journalists, shut down & looted media offices, and destroyed & seized journalists’ equipments, must be brought to justice and appropriate restitutions must be paid. •Steps must be taken to better the relations between the authorities and Media. Both sides must be encouraged to respect the rule of law and act responsibly. •Barriers between journalists and the right to information must be eliminated. Abusing the right to classify information by the government must be addressed in a way that guaranties the right of journalists to access information. •When Government officials break the law, or misuse their authorities, the law guaranties the right to publicly identify them. Therefore it is more productive for them to exercise their right to respond in public instead of censorship or furbelows lawsuits. Government officials must accept criticism as a method of improving their performance. •"Unprofessional” conduct of journalists must not be used to justify violence against them. Coverage of demonstrations without prior permit is not a justification for violating the Law of Organizing Journalistic Work. •Journalists must abide by the laws regulating journalistic work, and by professionalism in their conduct. They should maintain fairness and balance in their coverage of events. •Media organizations must be treated equally and not discriminated against in their quest for information. They should be able to cover, without barriers all the events that the public is interested in. If security constrains are valid for restraining access of some media outlets, then they should be as valid for others too. •Detention of journalists for their legal quest for information must end. •No security organ, other than police should be able to call journalists for interrogation. No interrogation should be allowed without a judge’s order. •We ask Kurdistan Parliament to form an investigative committee with appropriate authority to follow up on cases of violations against journalists, and cases of abuse & deactivation of the Journalistic Work Law and Freedom of Information Law. •KRG should pay careful attention to international and local organizations that monitor human rights and the rights of journalists. Rejection and denial are not the way to go in handling publicized cases of violations. •Media organizations must provide journalists with their journalistic equipments and means of protecting their lives. •The competitive nature of live coverage of events should not be a reason for lessening the standards of professionalism and fairness. Media networks should hold accuracy at a high regard and stay away from heightening anxiety and raw emotions among the citizens.